What does Alchemy do? How can you benefit? How can you get involved? Come along to the 2015 AGM to find out answers to these questions and more on 13th July at TRACs. 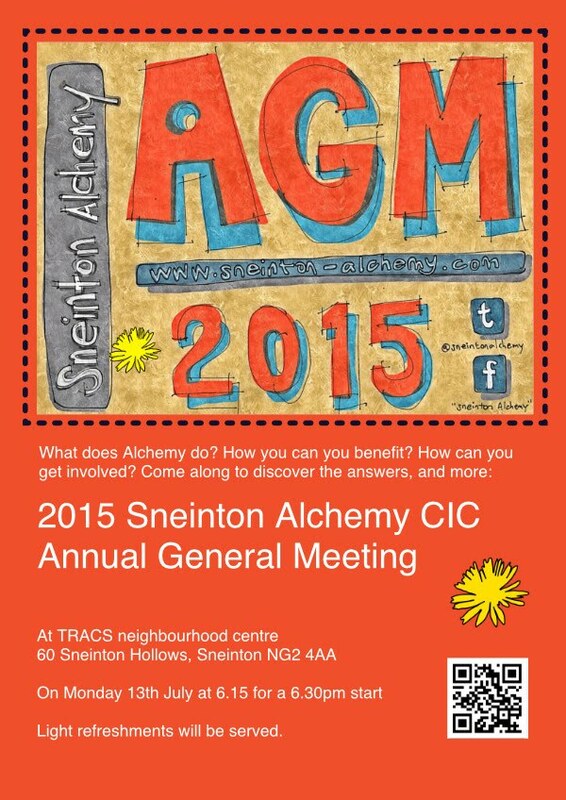 The 2015 AGM is open to all who have an interest in Sneinton Alchemy's work and would like to find out more. There will be light refreshments to keep us going! Members have voting rights, so why not join us now, or sign up at the AGM? Election of Directors (if you'd like to stand please contact us before July 27th so we can notify members). The meeting should be finished by 7.30pm. For more information on Sneinton Alchemy procedures and constitution, please see our 'About Us' page.